3Presentation on Spoken Syntax Method In most English language programs, the “Four Skills” of English are taught: Grammar, Reading, Writing, and Listening/Speaking (as a single course). One of an ESL teacher’s biggest challenges is that we too often produce students who can perform well on standardized reading, writing, and listening tests, but who cannot struggle their way through a single complete spoken sentence. It’s not only the phonemic aspects, the accent, the rhythm, etc., that trip students up; it’s the syntax itself–the syntax that they can produce very respectably in written form but can’t conjure out of their mouths. failing to “cascade” past tenses after the original past tense form in stories (“He wrote a letter saying he visit London last year.”). failing to use the right tense for a conversation in context. failing to use prepositions correctly. In conversation courses, teachers are usually adjured not to correct spoken grammar, in order not to disturb the fluency of the speaker. While this approach spares the student humiliation, it does nothing to improve his or her spoken syntax. In my classes, I have been working with a model for helping students correct their speech; the focus, note, is on spoken syntax, not on pronunciation. A small group (no more than 10, with teacher) sits in a circle so that everyone is equal. The teacher is a facilitator, a mediating but not a dominating presence. 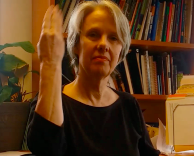 The teacher trains students in the use of hand gestures that will be used to nonverbally elicit correct syntax from students as they are speaking. The teacher asks students to consider a list of prompts that would tend to elicit answers in the target tense. For example, “Tell about a time when you were scared,” or “Tell about a time when you got lost.” These requests will both lead naturally to storytelling, which takes place in only two main tenses–simple past and past perfect. Students read the questions/prompts to each other in pairs or the teacher may read them. Students mark three questions that they find interesting. Going around the circle, the teacher asks each student to say the number of a question that is interesting to him or her. The teacher then asks the question to the student, stressing that the answer should be in several sentences, that is, longer than a very brief answer. The student answers the question. As the student is speaking, the teacher notes any syntax errors as they are occurring. Maintaining eye contact, the teacher chooses a relatively major error, say, in tense, and silently makes the correcting gesture as soon as the student makes the error. The student typically pauses and self-corrects. If the error is a matter of an idiom or usage issue, the teacher says, “We would say…” writes the idiom or usage on the board, and asks the whole class to repeat it five times to themselves. The conversation then returns to where it left off. The teacher asks students to note the incorrect and correct usages in a notebook that they keep for the purpose. It is gentle, in order to keep the affective barrier of stress at a minimum. It relies to a good extent on nonverbal (gestural) correction, so that the flow of spoken English is not interrupted even as the corrections are occurring. Students are taught a certain repertoire of gestures to correct their use of verb tenses and common prepositions at the outset of instruction. Students keep active Speech Journals during the class so that they can record the corrections that other students have to make. Dominant hand is turned with palm facing backward and moved over dominant shoulder. Hands “spin” around each other, ending by pointing forward with dominant hand. Dominant hand is held perpendicularly over other arm. Dominant hand’s fingers are bunched into the “cup” of the other hand. Two hands are piled on each other. Non-dominant hand is crossed by dominant hand; on the latter, fingers are pointed downward. Hands start palms together, dominant hand slides forward away from the other hand. Two fists touching, then separated laterally. Index finger of dominant hand points down and touches palm of non-dominant hand. This is remarkable–thank you for sharing some of the gestures–I began wondering almost at once what these gestures were, and you described them with words and photos clearly. See, I’m right. You ARE brilliant!